Nissan chief Carlos Ghosn stood by his company’s early jump into electric cars, predicting Wednesday that high gasoline prices will increase demand as production of the Leaf sedan ramps up later this year. Gasoline at $4 a gallon at the pump provides “great advertising” for electric cars, Ghosn told journalists after his speech at the New York International Auto show. Ghosn, president and chief executive officer of Nissan Motor Co, said the Leaf has been impacted by supply constraints tied to last year’s earthquake in Japan, as well as costs associated with a weaker yen. Availability should improve when the Nissan begins U.S. production of the vehicle this summer in Tennessee, he said. Initial customer satisfaction for the Japan-built Leafs sold in the U.S. thus far has been positive, with no complaints about performance, he said. Nissan is also readying the U.S. launch of a company that recycles electric car batteries, he said. Battery technology will continue to improve, with more investment dollars steered toward lighter and cheaper versions that hold more charge, he said. In March, Nissan sold 579 Leafs in the U.S., up from 298 last year. 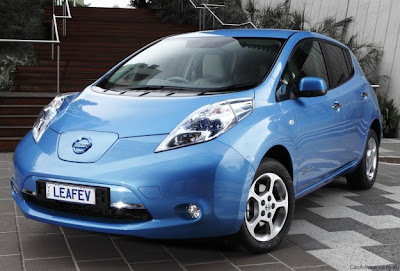 Nissan has sold 27,000 Leafs worldwide since 2011 as the top-selling zero emission vehicle in the industry, he said. The Nissan Leaf ranks as one of the first all-electric cars in the U.S. for mainstream auto buyers, along with the Tesla Motors Roadster. General Motors’ Chevrolet Volt runs on batteries for about 40 miles, before a gasoline-powered generator kicks in to recharge the car. In March, GM sold 2,289 Volts. GM said it was the best month for the car thus far. Ghosn said other car makers are readying electric cars Among them, Ford Motor Co. is rolling out a battery-powered version of its new Focus car this year.